About 500 years ago, Martin Luther visited Rome. 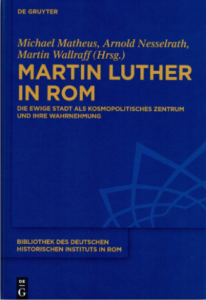 This volume seeks to impart a differentiated picture of the city of Rome, Luther’s Roman journey, and the recollected images associated with it: Martin Luther in Rom. Die Ewige Stadt als kosmopolitisches Zentrum und ihre Wahrnehmung, edited by Michael Matheus, Arnold Nesselrath and Martin Wallraff. About 500 years ago, Martin Luther visited Rome. Reflections about his journey often inquire as to its having been a critical factor for the Reformation, a prejudicial perspective often leading to a negative view of the trip and the city. 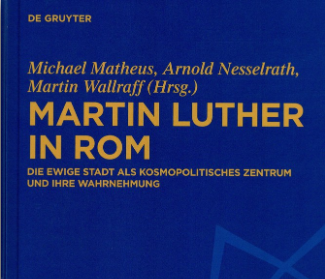 The volume seeks to free up the theme from this paradigm, and to impart a differentiated picture of the city of Rome, Luther’s Roman journey, and the recollected images associated with it.